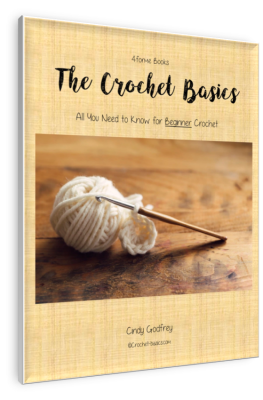 The larksfoot crochet stitch is made by working crochet spike stitches through your piece. 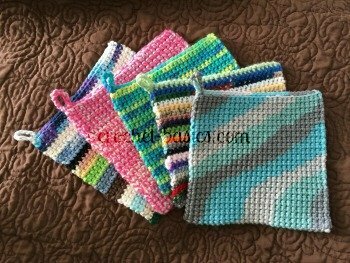 It makes a really fun pattern, especially if you work the rows with different colors of yarn. It’s beautiful when worked in all the same color, as well. It gives your work a great texture, too. Keeping your spike stitches even will be the challenge with this stitch and may take a little practice. You don’t want to pull these stitches too tight or your material will pucker. If they are too loose, your stitches will sag. Keep at it, though, because when you get it right, you’ll love the outcome. In this sampler I’m using two different colors. That way the stitch will easily stand out and be a little easier to understand. If you want to use just one color for you first try, just skip the directions about changing yarn. Let's get started with a sample. Continue from * to * across to the end of the row. Turn. Repeat from * to * across to the end of row. Larksfoot Crochet Stitch Help . . . In this sampler I don’t cut off color A. It stays attached while I work color B. I wouldn’t normal do this working with double crochet since it will leave a longer piece of yarn between the rows. Since this is just a sample I decided to go ahead and do that. You can see in the picture what I am talking about. If this is confusing to you, then cut off color A and start with color B. If you would like to try leaving it attached, just be careful that it doesn’t get tangled in you work. When you change back to color A, it will already be attached and there won’t be any ends to tie in. Repeat from * to * to the end of the row. Turn. Repeat from * to * across the row. Turn. Repeat rows 3 – 6. 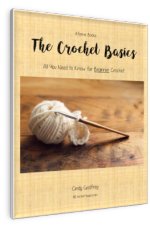 Isn't larksfoot crochet stitch awesome! It has such a great visual effect to it and great texture, too! You can also work this pattern by alternating colors on every row. It will give it a completely different look. If you work the pattern in the way, you cannot leave your yarn attached. It will need to be cut at the end of each row. You could also try using more than two colors, which is a whole other look. There are so many different ways you could experiment with this stitch. Don’t be afraid to explore with colors. 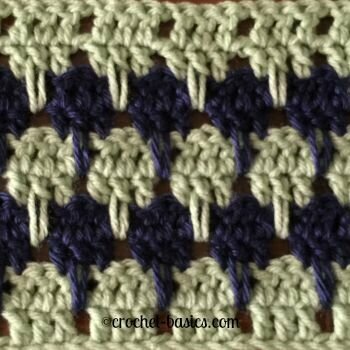 Have fun with the larksfoot crochet stitch!